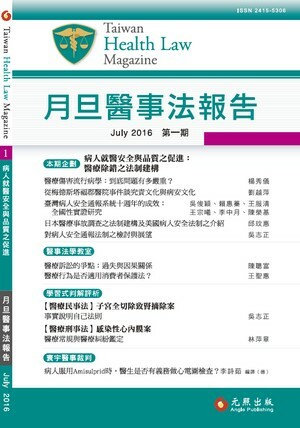 The number of medical liability insurance in Taiwan is not sufficient. Not only the insurers have difficulty in assessing the legal risk in medical disputes, but also the physicians are not willing to use the medical liability insurance. It has been a tough question that how to diversify the risk of huge number damages, and that how to lessen the burden on the hospitals and physicians. However, the medical liability insurance still play a role in stabling the medical system in Taiwan. For one hand, the medical liability insurance can relieve the physicians from the psychological and economical pressure of medical suits. For the other hand, the insurance company, which is with much more profession and experience in dealing with medical disputes, can integrate the legal and medical resource together to resolve the medical disputes more efficiently and properly. As a result, the medical liability insurance can lessen the amounts of medical suits, and cannot be replaced by other legal or social systems in Taiwan.